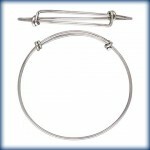 We love this Beadalon Bracelet Jig to make an adjustable charm bangle. It was voted “Hot” Product of CHA in 2015 (CHA is the Craft Hobby Association). It is simple and so very popular this year thanks to Alex and Ani. You’ll want to make dozens. Wear them in stacks. You don’t have to have this jig to make the bracelet. Use a drink can or other bottle to wrap the wire to give it a nice round shape. You can spread the overlap apart if you need it larger or squeeze it a bit further for a smaller size. The key here is that you want to put the charm which fits inside the overlapping wire before you close the loops. The charms that float you can add at the end. You need only a pair of side cutters to cut the wire and 2 long nose pliers to open and close the endings as well as the charms you add. Watch Wyatt White, Product Manager, from Beadalon as he shows you how to make this bracelet. Wyatt recommends 18 gauge half hard wire so it maintains it’s shape better. In our bracelet, we used Beadalon 18 gauge Silver Plated Wire. 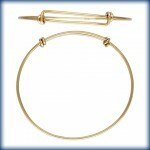 We also have pre-made bracelets in Sterling Silver and in Vermeil (Gold Plate over Sterling).